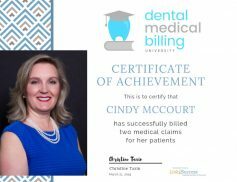 Dental Medical Billing University is a conglomerate of renowned dental and medical billing experts who have joined together to offer the highest level of training to dental professionals in the comfort of their own offices or homes. Our online format allows learners to pace themselves through the courses as well as go back and re-watch any session at any time. We are constantly updating and adding information, so don’t wait! Join today! Your course on medical billing was amazing, wish it was longer. Please, don’t hesitate to contact me when you set a date for another course in South Florida. Are you looking for a dentist who can bill medical? We’ve compiled a list of certified providers who’ve taken our courses. Congratulations to these winners for their successful completion and application of our courses! Will you be the next to make it into Dental Medical Billing’s Hall of Fame? 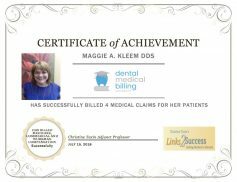 A membership to Dental Medical Billing is quality content presented in an innovative way that’s proven to improve your comprehension and retention. Check out these examples of our quality webinars and guided presentations that will help ensure your long-term success. Have you considered outsourcing your medical billing? Click below to learn how Dental Medical Billing can help your practice significantly increase its revenue. Take the complexity out of your difficult claims with unlimited monthly support for only $99 per month. Learn and receive feedback from the professionals in realtime with scheduled, live consultations. Expand your knowledge by seeking clarification from the experts in our online forums. When Are Restorative Dental Treatments Medically Necessary? Want to Streamline Your Medical Billing for Dental Procedures?